For all the publicity generated by zany beer ads (and their catchy slogans – think “Dilly Dilly”), it seems consumers are sticking to the brands they like buying already. 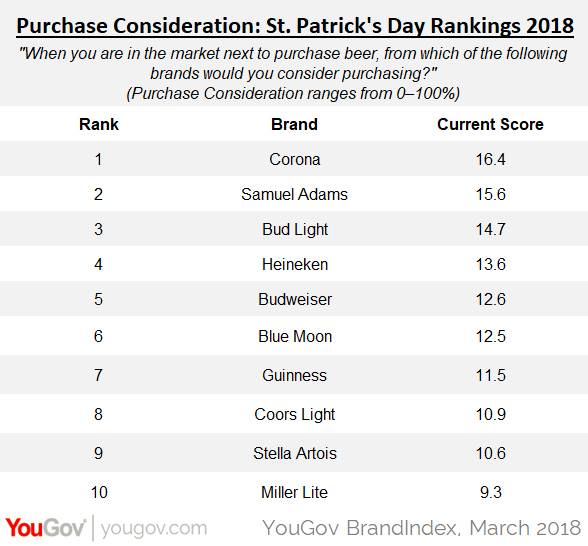 Samuel Adams and Corona tied as the best perceived beer brands in America in YouGov BrandIndex’s annual St. Patrick’s Day ranking, while Budweiser retained its third place position, a repeat of last year’s top three brands. Yet, even brands such as these that rank high in perception or Ad Awareness have not persuaded enough consumers to change their consideration of what beer to purchase, according to YouGov BrandIndex data. 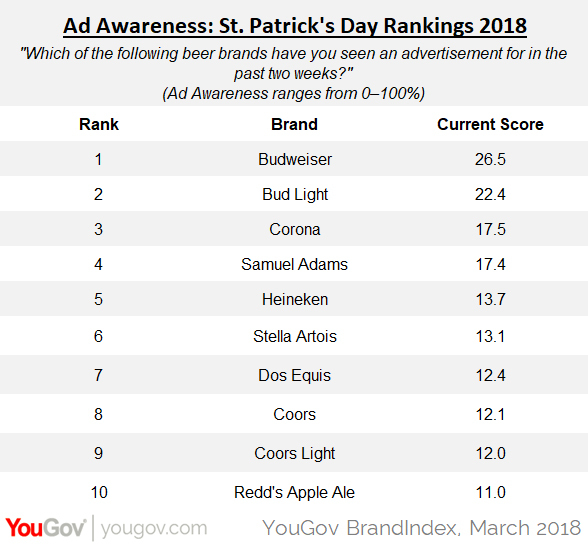 Between St. Patrick’s Day in 2017 and now, no major beer brand has changed its Purchase Consideration either up or down by a significant measure. The beer sector is so competitive that even small data moves may have large ramifications in possible market share and visibility. Even the much talked-about “Dilly Dilly” which ran the second half of 2017 didn’t stop Bud Light to experience its biggest volume drop of 5.7%. Overall beer sales slid 0.5% in 2017. This overall trend of advertising causing more water cooler talk than sales may force beer manufacturers to go back to the drawing board not only with their marketing but to their products as well. Budweiser and Bud Light are the number one and two brands in Ad Awareness, with 26% of drinking-age adults recalling seeing a Bud ad in the past two weeks, followed by Bud Light at 22%. These both represent significant increases from one year ago, along with Michelob Ultra, the beer with the 15th highest Ad Awareness. Six brands saw their Ad Awareness decrease significantly from one year ago, including tied-for-first-place Corona, as well as Dos Equis, Redd’s Apple Ale, Yuengling, Shock Top, and Dogfish Head. Yet, Purchase Consideration remains unchanged across the board from one year ago, with Corona and Samuel Adams on top with 16% of adults 21 and over considering buying it the next time they purchase beer, followed by Bud Light at 15%. Michelob Ultra is the beer brand with the 15th highest Purchase Consideration just as it is with Ad Awareness. 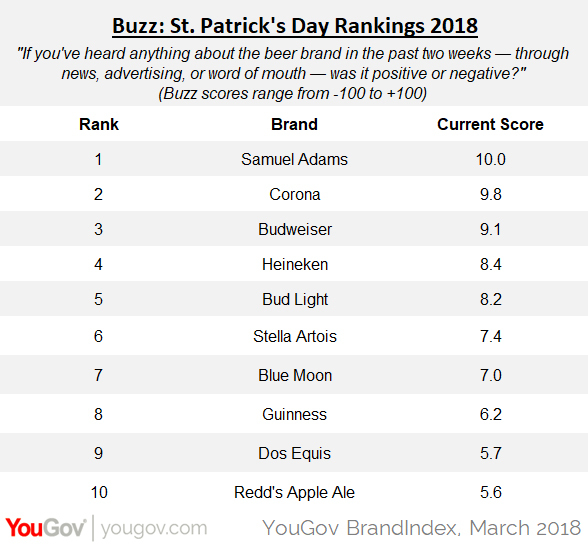 All major beer brands were measured using YouGov BrandIndex’s Buzz score, which ask respondents: "If you've heard anything about the brand in the last two weeks, through advertising, news or word of mouth, was it positive or negative?" All results reflect adults age 21 and over.